PPC's Guide to Cash, Tax, and Other Bases of Accounting gives you clear guidance on financial statements prepared using a special purpose framework, also commonly known as an other comprehensive basis of accounting. 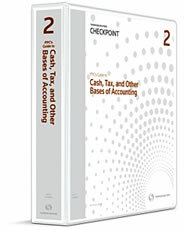 The Guide not only explains the unique measurement and disclosure requirements of each basis of accounting, but the reporting options as well. It comes with both cash basis and tax basis disclosure checklists, example financial statements that cover a variety of entity types, note disclosures, and tailored compilation and review practice aids.